Father Christmas, Santa Claus or Kris Kringle no matter what you call him he makes a special appearance on this Christmas cake! This was another rich fruit cake covered in marzipan and icing. The sack was made using chocolate flavoured icing and I inserted large edible teardrops to add colour to it. The rope around the top of it was made from marzipan. 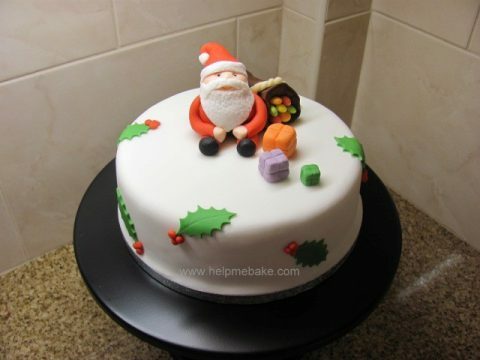 Father Christmas himself was made using Black, White and Red Icing. I used paprika colouring for the flesh face colour. The presents on the top of the cake are dyed white icing, moulded into squares and the lines were made using the back of a knife. I also used a holly leaf cutter for the leaves and rolled the cherries myself.